I have been here awhile. It wasn’t a good night, but we knew it was going to be a fight. Yesterday was a hard day. I am in physical pain that won’t let up. It is making me exhausted physically, emotionally, and spiritually. When I get low on reserves I get super raw. I also overthink. Super freaking fun combo! I leaned into the rawness yesterday. I know that when I shove things down they grow into dark voids that consume me. So I sit with it. I go for a long drive, turn up the music, turn the music up louder, double check the settings on the phone and turn it up even louder. Yes, my windows are shaking but so is my soul. I go to a place that brings me peace. I weep. What’s wrong? Nothing. No, everything. I mean it’s been worse. Damn, I am not dead or anything. So yeah nothing. No, really, EVERYTHING IS WRONG!! I contemplate cancelling my evening plans. Uh Beck that isn’t wise, but I look at it anyways. Screw it, I am going. I arrive early, because the ability to plan has left me. I tell the hostess it’s rough, but I am here, I cannot drink tonight no matter what. I nibble, laugh, rub my jaw, try to escape from my own personal hell, play cards. Eventually, I decide I have to go home. I simply hurt too much. My friend stops me in the driveway. Why am I so worried about you?! My response, because this is what relapse looks like. Relapse is being frantic with pain, but terrified at the dance that opiates bring. Relapse looks like exhaustion with no real end in sight. Relapse looks like isolation and struggle all with a false grin plastered across the face. Relapse looks like wanting to escape this darkness and being willing to entertain the darkness of numb aka addiction. Relapse is standing 6 inches from a loved ones face and feeling 6 football fields of distance between us. Relapse never looks like what we think it does. Relapse is desperation. Relapse is running out of other choices and returning to the familiar of the abyss of numb. I am vaguely aware of the offers that surround me to come stay the night, I can sit up with you, I am here, and please text me when you get home, have I mentioned I am worried?!? I arrive home. I send my text stating I am home. I receive back love, support, and encouragement. I pace. I send a PM to my person and say it’s bad. He reiterates that I have a place at his house too if I need. He listens. There is no magic wand, but there is the support of love that feels magic. I listen to a meditation. I ice my face. I sob. I take more ibuprofen. More oil pulling. it’s 3 am. I stumble to my yoga room. Music turned up and I start to flow. I ask this container how do you need to move to release the pain? How do you need to move to make space for what is coming? How do you need to breathe to find strength in this moment? How do you need to chant to ignite that internal agni? What dear container do you need? Yes, this is what relapse looks like. Yes, this is what it means to fight to be sober. 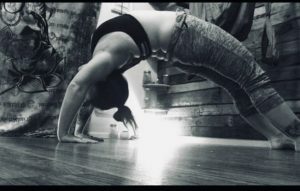 Yes, this is what it looks like when I spill onto my mat time and time again releasing, refilling, replacing, rebuilding. When I say “Saved by Yoga.” Please know I wouldn’t be here this morning, or any day in the past decade, without my practice. Last night, I chose to fall into my practice and not into a bottle, a needle, or a pill.